Wearing an Italian silk necktie is one way to let people know that you care about fashion, even when you're locked into a business suit or in the very least a button-up shirt with slacks day in and day out. What's Special About Italian Silk Neckties? Italian silk neckties are known for being items of luxury as far as business attire is concerned. There are only so many things you can do to take a standard shirt, tie, and slacks or business suit up a notch and stand out among your peers. Exude class and sophistication with just one simple item, knotted just so. When you purchase Italian silk neckties, you can generally expect high quality items that were made with care. As with any silk neckties, the Italian variety will hang straight down instead of being difficult to position (and then keep in position). It will also glow in direct light, giving it a luminous, beautiful appearance. You can expect to pay more on average for Italian silk ties than you would any other type of silk ties simply because the designers look upon the craft of creating them as an opportunity to create true art. They're detailed, stunning to look at and rare compared to other types. Expect to be the center of attention at a party or at least garner a few extra glances in your direction if you wear one to the office. Ties-Necktie.com: Have a look at their impressive designer collection to find the silk ties that will best suit your business wardrobe. Executive Accessories: This site offers exquisite Pinoti silk ties from Italy. Within the collection, there are designs you're unlikely to see anywhere else, with the rich, gleaming colors associated with Italian silk ties. Raffaello Ties: When you visit this site, you'll see a listing of designer neckties from names such as Dolce and Gabbana, Armani, Gucci and more. Expect high quality silk ties from designers with fabulous reputations within the fashion industry. There is one downside to buying Italian silk ties or silk neckties in general. Cleaning them is usually next to impossible. They can be dry cleaned and spot treated, but your best bet is to just be extremely careful when wearing them to avoid stains altogether. 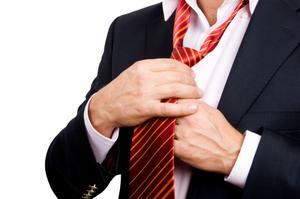 As soon as you spill something on your tie, try blotting it with a dry cloth to remove most of the residue. In addition, you should keep in mind that silk is far from a wrinkle-resistant fabric, and taking it off as soon as possible, then hanging it up, is the best way to protect against unsightly wrinkles and creases. Not all websites will offer information past the fact that the ties are made from silk. However, silk ties can come from other regions-not just Italy-and while they may be nice and pair well with the shirts you already have, the ties' quality may not be the same as their Italian counterparts. If you're concerned about getting some of the most sophisticated and luxurious silk ties on the market, don't hesitate to ask questions.